A number of years ago, an attorney with my law firm was sued by a father in a paternity case in which she served as the guardian ad litem. The lawsuit, for $3.2 million, alleged that his constitutional rights for equal placement with his child had been violated, as the GAL recommended primary placement with the mother. Besides the minor detail that no such right exists in the constitution, the lawsuit did not mention the fact that the father stipulated to the GAL’s recommendation and the case never went to trial. Nevertheless, the trial judge, and the lawyer who represented the mother were also named as defendants. In the motion for summary judgement, I argued on behalf of my partner that a simple dismissal would not be justice. Without a scintilla of any legal basis, the lawsuit required my time, the time of an attorney for the mother’s lawyer and an assistant attorney general to represent the judge. Some assessment of frivolous costs was necessary, I argued, to impress upon the father that filing a frivolous lawsuit was not a victimless crime. The judge dismissed the lawsuit and denied the request for frivolous costs. A short time later, the father sued all three lawyers (including yours truly) plus the judge who denied costs, for $54 million in federal court. The lawsuit was eventually dismissed (also without sanctions). Yet at each of these steps in this frivolous lawsuit, costs were incurred by lawyers and taxpayers, both to defend the judges and for the court time in dismissing the action. Recently, the Wisconsin Court of Appeals took action in a case where a litigant filed numerous frivolous actions. In Puchner v. Hepperla, 2001 WI App. 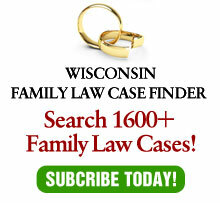 50, the court took strong action against a “frequent filer” in family court. Following the divorce, Pucherner filed 20 cases in the appellate court relating to his ex-wife. In six cases, the trial court was affirmed. Two cases were dismissed for lack of jurisdiction. Two were dismissed for failing to comply with rules of appellate procedure. Nine petitions requesting the appellate court to exercise supervisory jurisdiction over the trial court were dismissed or denied. In the most recent appeals, Puchner attempted to appeal an order granting summary judgment dismissing a defamation action against his former wife, her attorney and her mother. As his appeal was not timely, the court of appeals refused to address the merits, rather, using the occasion to find his appeal frivolous. At the same time, the court of appeals struck a brief Puchner filed in an appeal from a no contact order with his former wife. The court found the brief vindictive, scurrilous and offensive. As sanctions, the court not only remanded the cases back to the circuit court for a determination of costs, but also barred Puchner from commencing any new actions in the circuit court or the court of appeals until the costs, fees and attorney fees are paid in full. Frivolous actions seem to occur more frequently in family court than in most other areas of law. Sometimes, as in Puchner, it takes the form of frequent lawsuits against an ex- spouse. Sometimes, such as the case my office had to deal with, it takes the form of lawsuits against the GAL, undoubtably with the intent of disqualifying what is felt to be an unfavorable GAL in favor of one who will see things differently. Whoever the target, the effect is, as the court in Puchner recognized, a heavy burden on the court system, as well as the costs to the victims. Yet, a nagging question occurs upon reading the facts in Puchner. Why did it take the court 19 previous appeals and other filings before taking actions against Mr. Puchner? Certainly, it must have been apparent prior to action No. 20 that the cost to the victims and the system needed to be minimized. Some of the reasons why it takes the courts 20 proceedings to finally take action stem from the desire of the courts to be open to all and to afford leniency to pro se litigants. Yet, does it really take 20 unsuccessful actions before judges realize that allowing such liberality plays directly into the hands of those who use it for harassment and other improper purposes? Frivolous lawsuits are not victimless. Rather, they injure the innocent targets, the courts who have deal with them and legitimate litigants waiting for their turn. Hopefully, courts will use Puchner as a basis to halt the people who misuse the court system before too much harm is done to the innocent.